Born in 1970 in Lviv, Ukraine. Graduated Lvov Institute of Decorative and Applied Arts, Department of Art Glass. Lives and works in Uzhhorod, Lviv, Kyiv, Ukraine. 2007 Installation, together with V.Kaufmann and T.Benyah, DZIGA Gallery, Lviv, Ukraine. 2004 VERSUS, multimedia project, curator, National Union of Architects of Ukraine, Kyiv, Ukraine. 1999 Барокові рецидиви, "Shody" Gallery, Warsaw, Poland. 1998 Personal painting exhibition, Palace of Arts, Lviv, Ukraine. 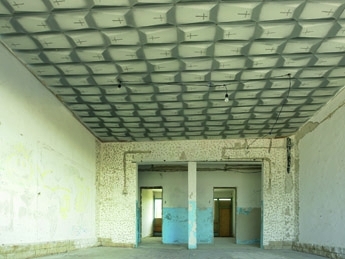 2010 "Waiting room" installation, New Man, international symposium of contemporary art "Biruchiy 0010", Zaporizhya, Ukraine. 2009 As variant, international symposium of contemporary art "Biruchiy 009", Zaporizhya, Ukraine. 2008 "Avatarium", multimedia project, Actual Art Week, the Center of City History of Central and Western Europe Gallery, Lviv, Ukraine. 2005 "Ad lucem", installation, international project "Ecology ZOOO", Lviv, Ukraine. 2004 "Bathroom" art-project, "Goodbye Arms" exhibition, ARSENAL, Kyiv, Ukraine. "Чорна хата", installation, "Cultural hero" art-festival, "Dzyga" Gallery, Lviv; KARAS GALLERY, Kiyv, Ukraine. 2003 50, Lubomirski’s Palace, Lviv, Ukraine. 2001 "Schnittpunkt", international project, Lvov-Stuttgart-Lodz, Ukraine-Germany-Poland. "Kitchen", installation, the refectory of the Dominican Monastery, Lviv, Ukraine. "Skin", Deutsche Telekom, Stuttgart, Germany. "Чорна хата", installation, Forumfabrikum, Lodz, Poland. 2000 "Dances", installation, together with T.Benyah, DZIGA Gallery, Lviv, Ukraine.